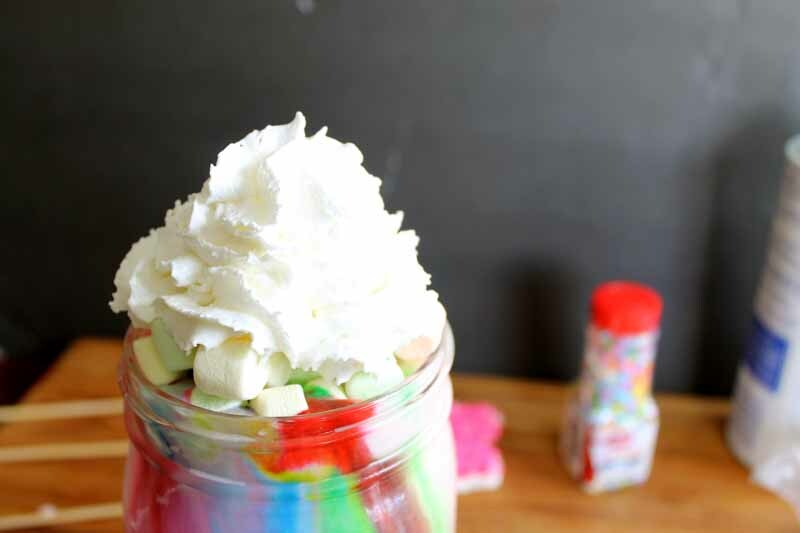 You are here: Home » recipes » Unicorn Drink – the ultimate milkshake and more! 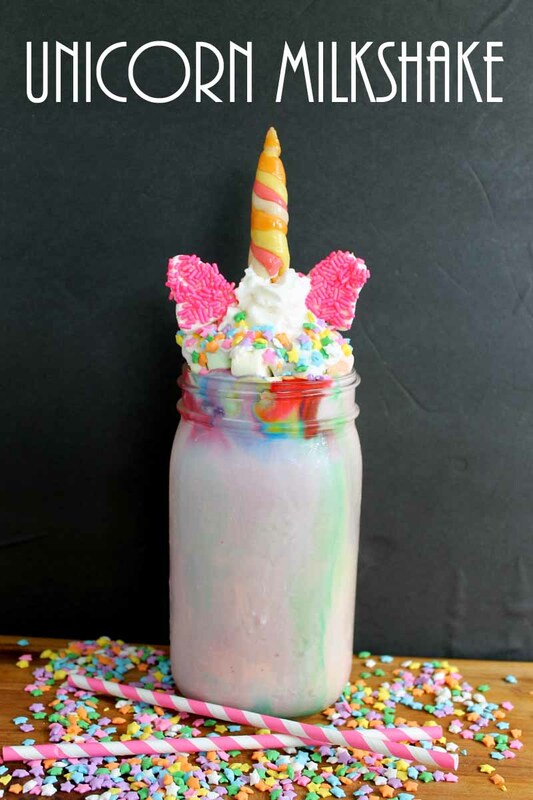 Have you jumped on the unicorn drink craze? Starbucks seems to have kicked off a huge trend with their over the top unicorn drink. 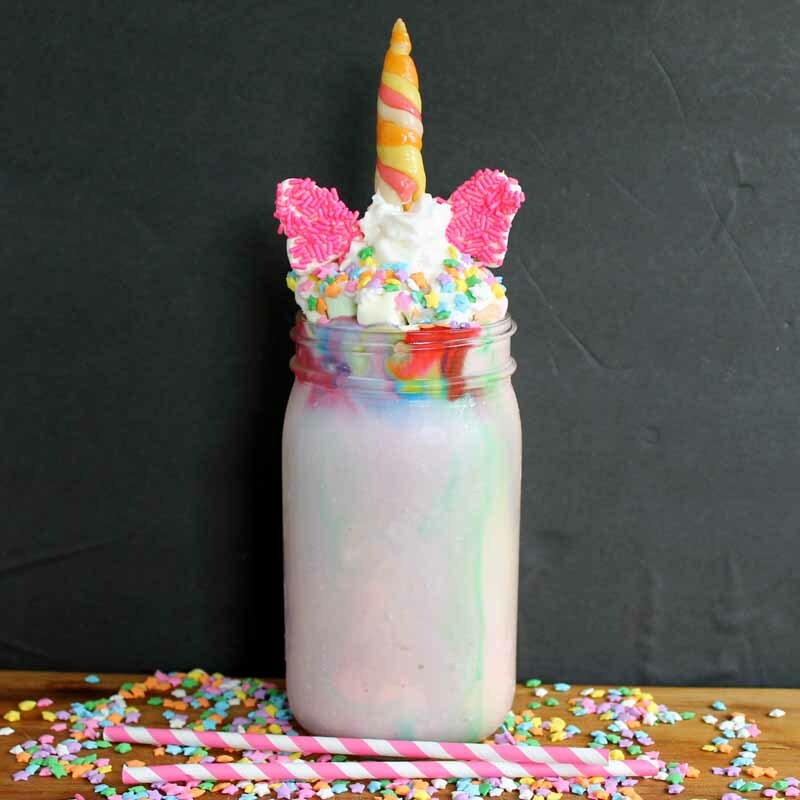 I thought I would jump on board with a fun unicorn milkshake. I actually convinced some other bloggers to join me and their unicorn drinks are linked up at the bottom of this post. 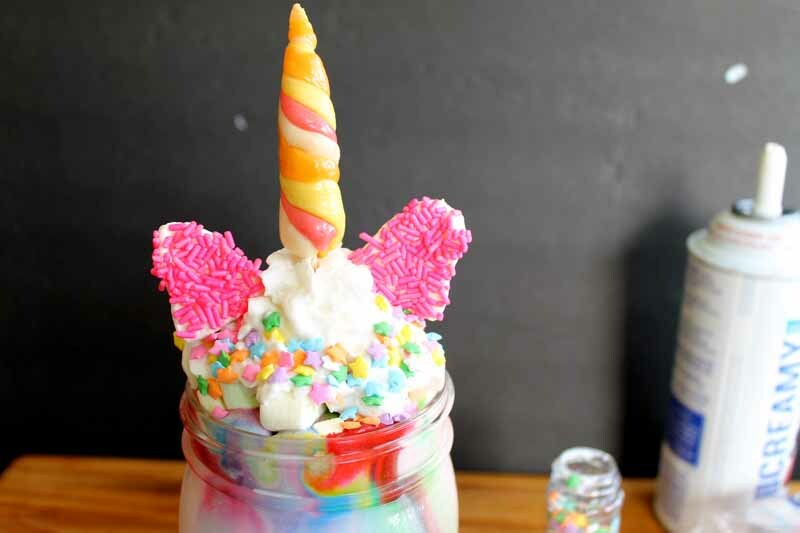 You can have a ton of fun with any of these unicorn themed concoctions! Every unicorn drink needs a unicorn horn and my milkshake is no different. 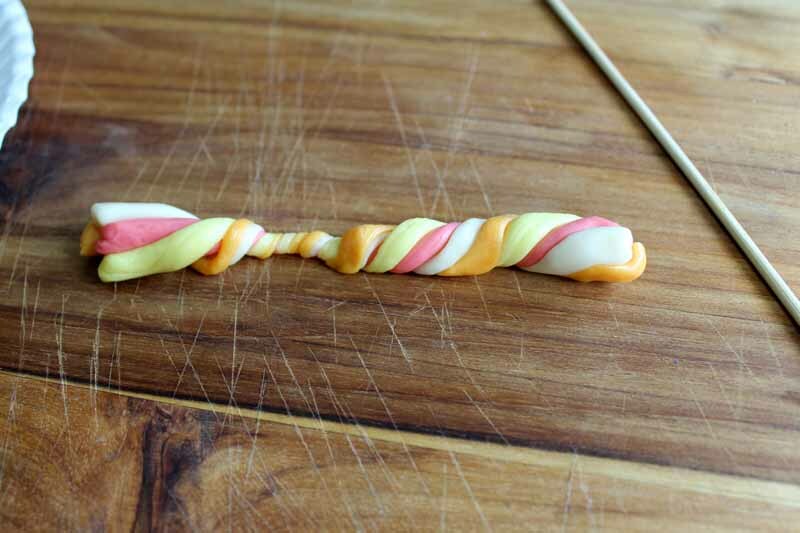 I actually made a candy horn using a few fruit chews and a wood skewer. 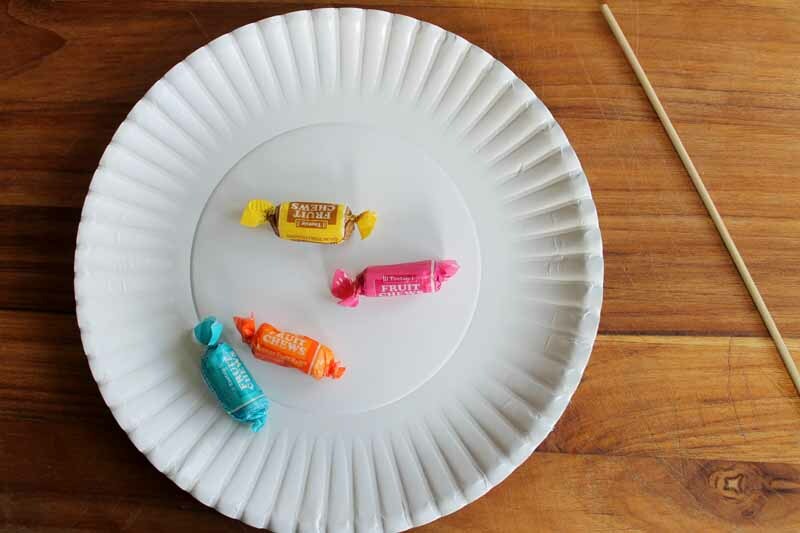 Unwrap the candies and put them in the microwave for 10 – 15 seconds to get them soft. 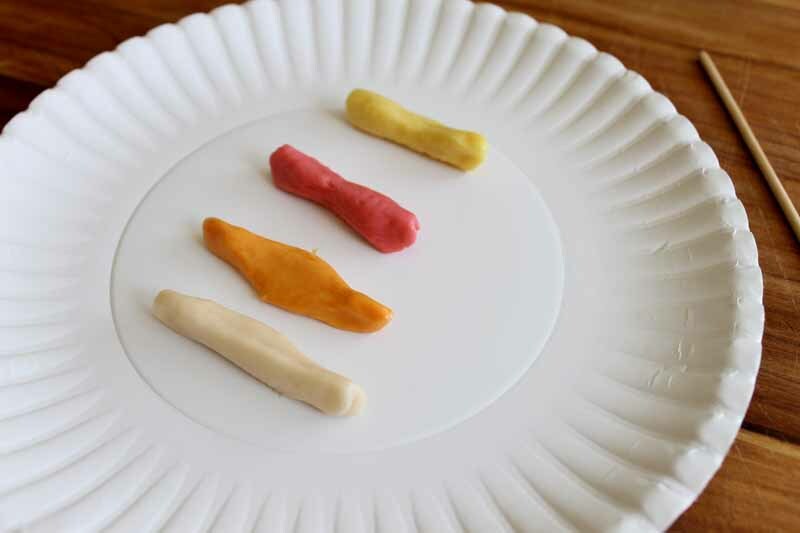 Be sure to put them on a plate first as they will stick! Start pulling them into long skinny strands with your hands. Use caution as they may be hot. Twist the strands together into a cone like shape. 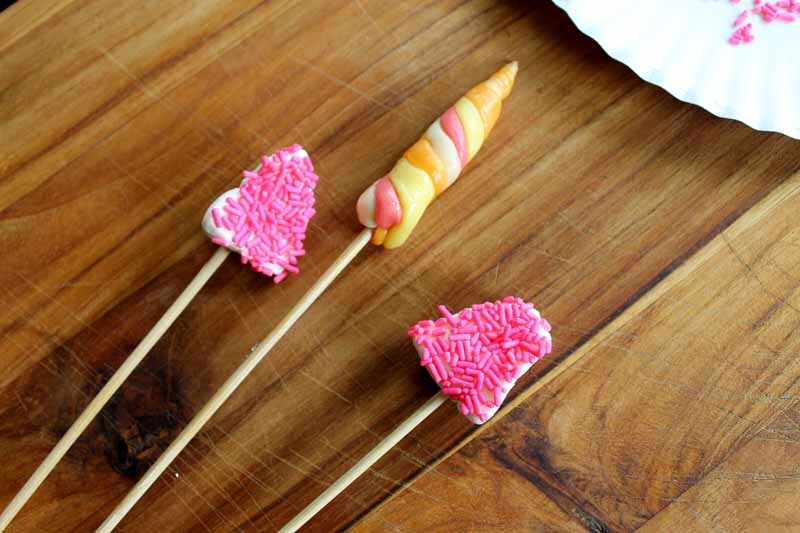 Add your unicorn horn to the wood skewer and it is ready for your unicorn drink! Now we need some unicorn ears! 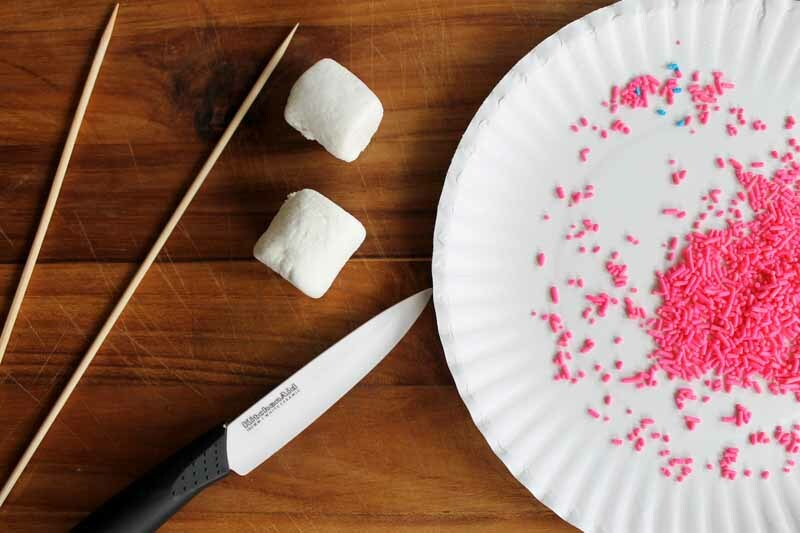 I used large marshmallows, pink sprinkles, and wood skewers. 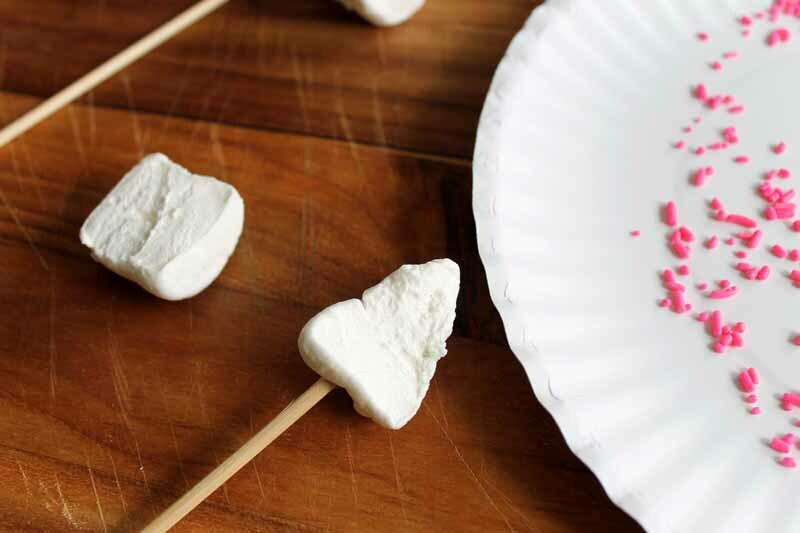 Cut the marshmallows in half then shape with your hands into an ear shape. Add to a wood skewer. The cut edge will be really sticky. Dip that cut edge into sprinkles and you have a cute unicorn ear. Once you have two ears and a horn, you are ready to make your unicorn milkshake! Please note before we get started that this milkshake is intended to be shared among two or more people. This is definitely NOT a single serving! Start by mixing up the milkshake in a separate container. I mixed up two batches but you can do it all at once. Just mix 3 cups of ice cream with enough milk to make it the consistency that you like. I used strawberry for half of mine and vanilla for the other half. Mix any milkshake that you love! Note that a pink or white version will probably work best with the food colors. The recipe for this portion does not matter. The magic is in the food coloring! If you are serving this to your kids, now is the time to invite them into the kitchen. They will want to watch the magic happen! 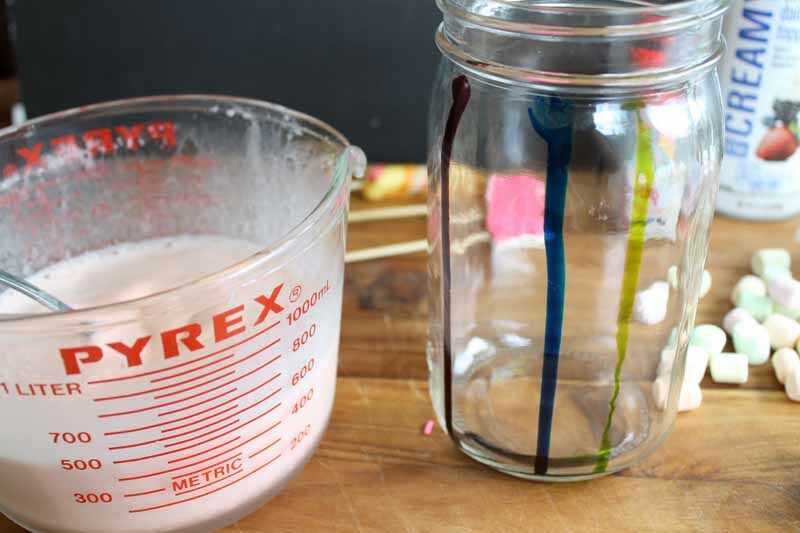 Drip some food coloring down the side of your jar as shown below. Add any colors that you like! Fill the jar about half way with milk shake. The colors start to blend and mix….magic! 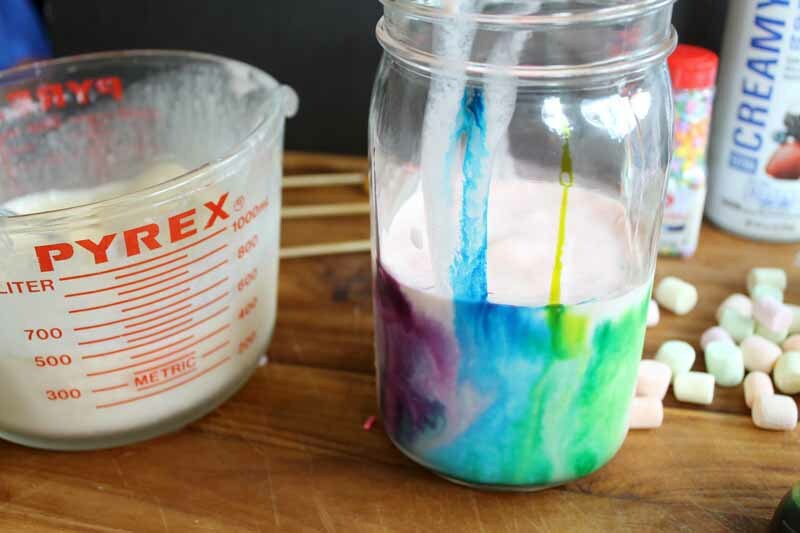 Add a few more drips of food coloring and fill the jar up to the threads with your milkshake. The magic of the colors will continue to swirl inside of your jar. 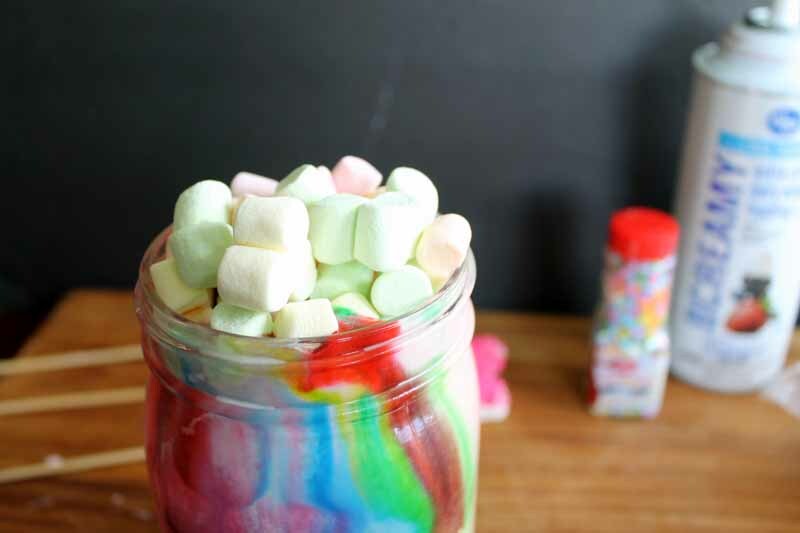 Top off your unicorn drink with a handful of colorful marshmallows. Then a crown of whipped cream. Add on star sprinkles just because! 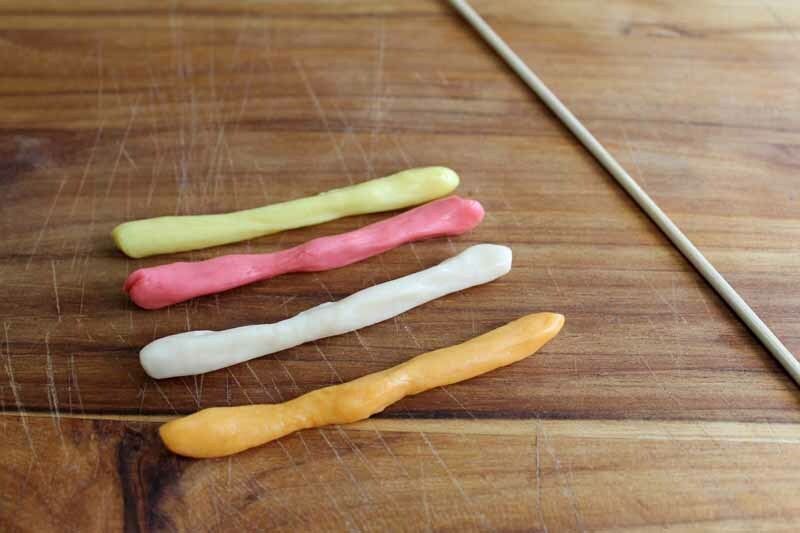 Then cut off your skewers to length and add your horn and ears to the top. 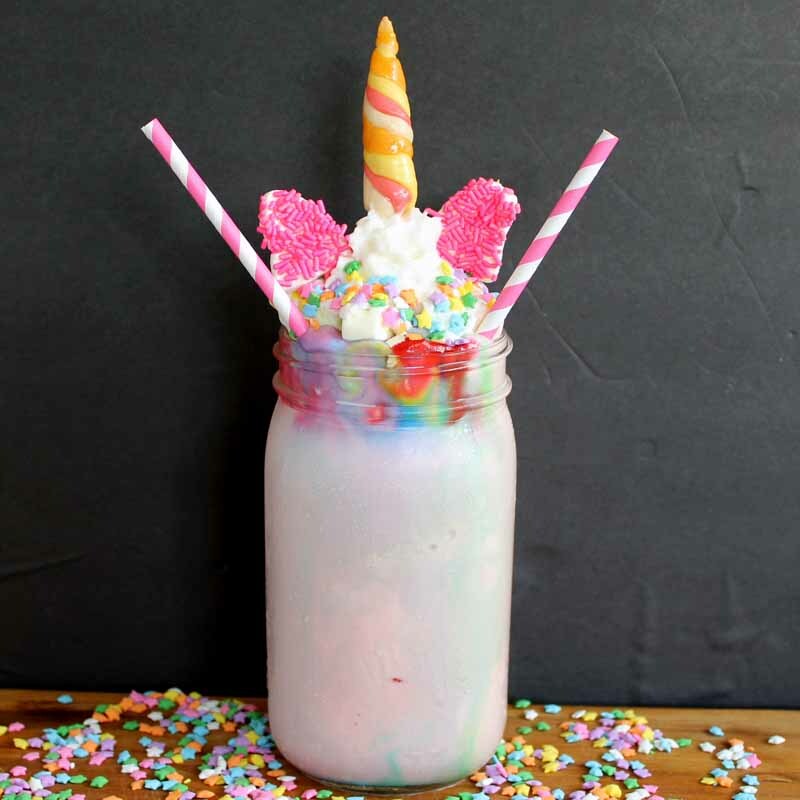 This unicorn drink is ready to serve to anyone that you love! 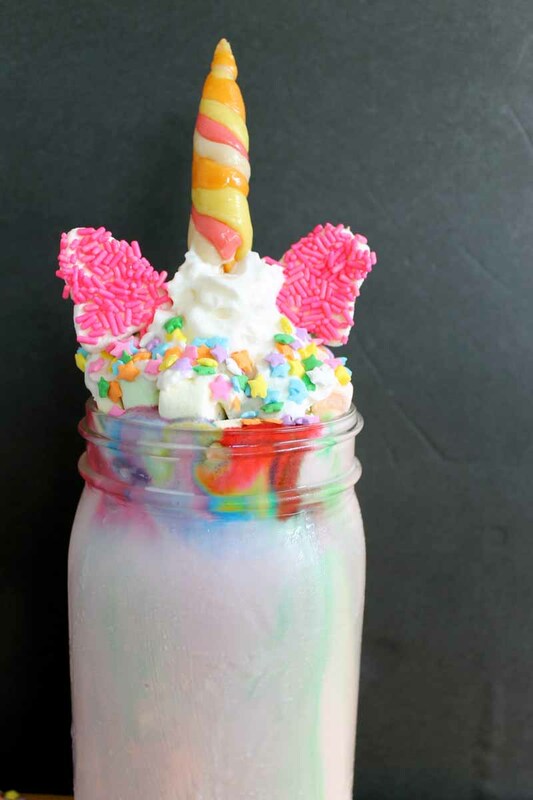 Who will you enjoy a unicorn milkshake with? You should definitely serve it with these unicorn cupcakes. 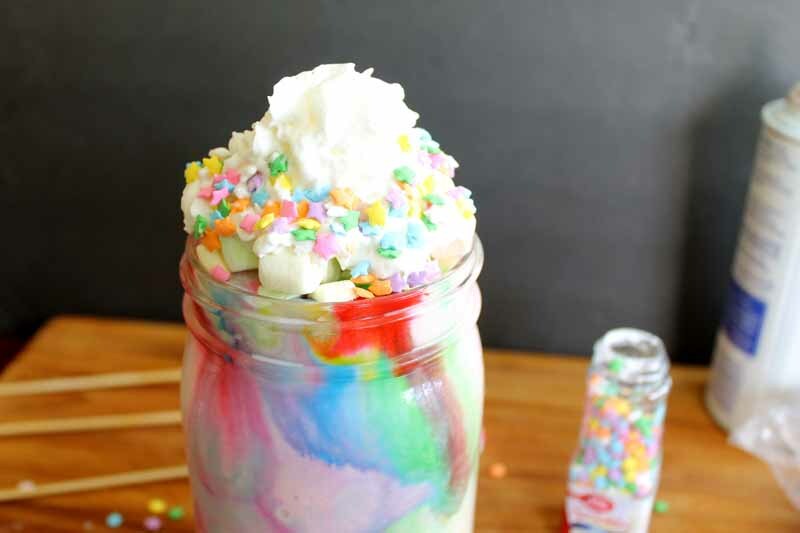 Add in two or more fun straws and devour this delicious and fun unicorn drink. The results are tasty as well as fun! Mix 3 cups of ice cream with enough milk to make it the consistency that you like. Fill the jar about half way with milk shake. 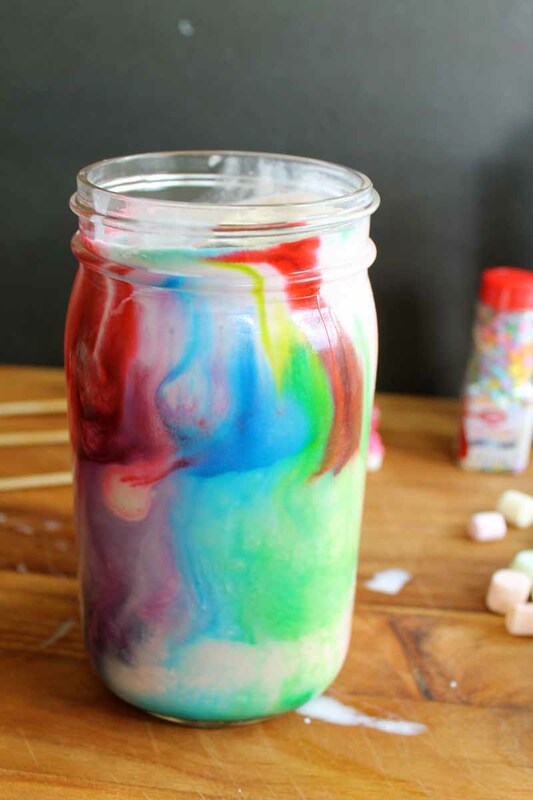 Add a few more drips of food coloring and fill the jar up to the threads with your milkshake. Add a crown of whipped cream. 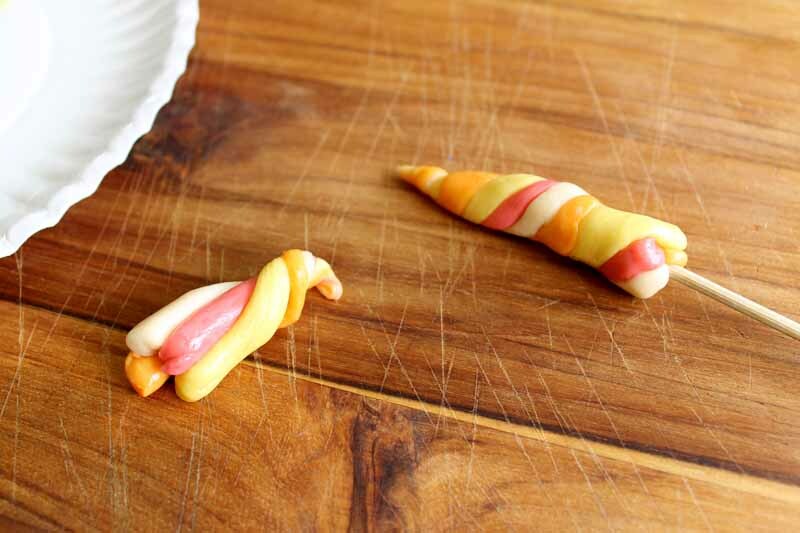 Cut off your skewers to length and add your horn and ears to the top. This milkshake is intended to be shared among two or more people. Ready for some more unicorn drink ideas? I have them for you! previous post: Simple Brunch Ideas for Mother’s Day and More! next post: Kite Craft: Making a kite with a paper plate! This is so cute!!! 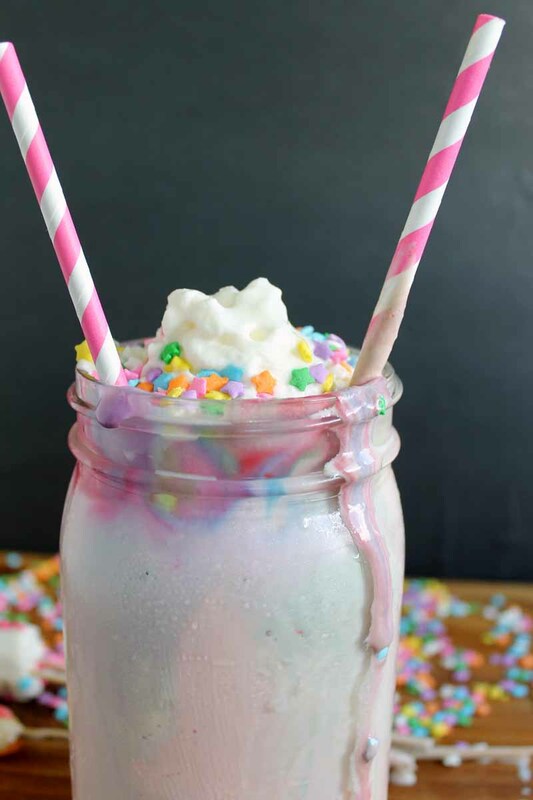 The unicorn drink trend is honestly crazy right 🙂 I did a DIY unicorn frappe post on my blog if you want to check it out! Such a great idea for the next birthday party of my daughter who is totally into unicorns at the moment! Thanks for sharing! That is so much fun!!! And it looks delicious! Angie, This is so cute and fun! Pinned to share. Oh man… this looks delicious! My little one is obsessed with unicorns right now, so I may have to give these a try in a mini sized version. Thank you for sharing! This is so cute! 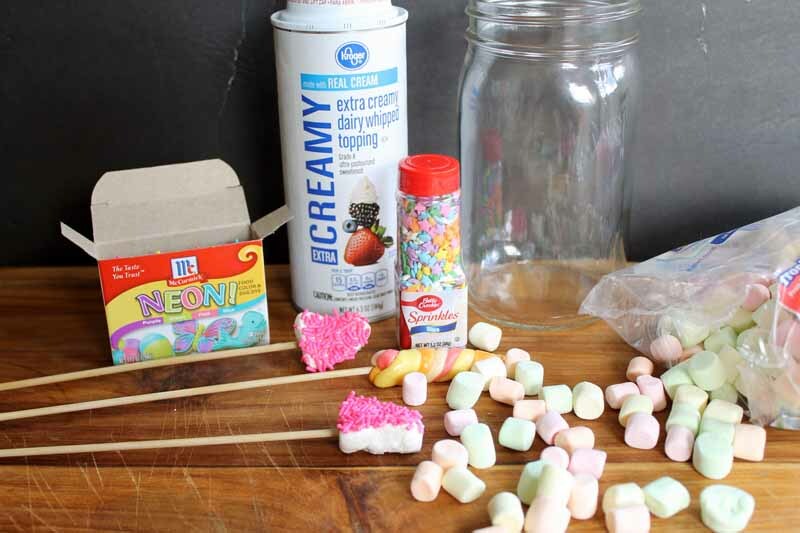 This would be really fun as a little girl’s birthday party idea, too! Thank you for sharing! Aw how cute is this?! LOVE it! 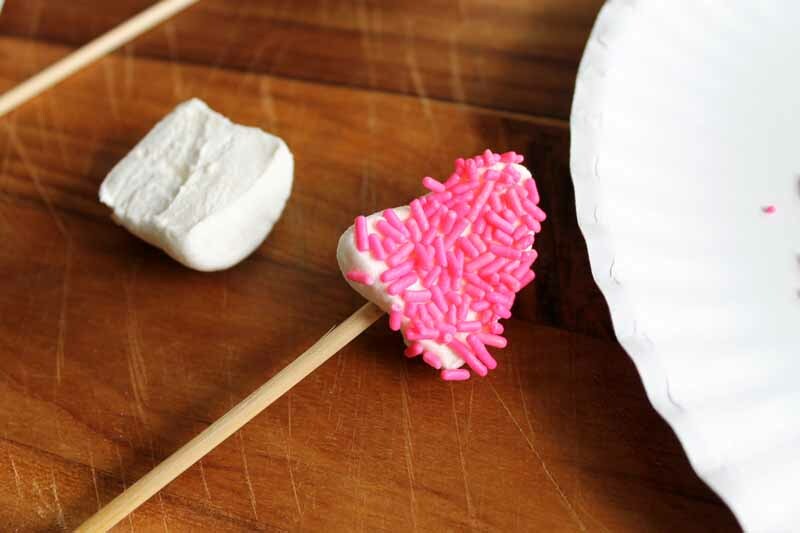 What a fun treat idea! I’m on sugar overload just looking at it which means my kiddos would love it! Lol. Thanks for sharing your recipe with us at Merry Monday this week! Hi Angie. What a yummy idea! I know my daughter would absolutely love this drink. You’re my feature this week at Welcome Home Wednesdays! Congrats! See you tomorrow. Oh yummy! Thanks for sharing at the Inspiration Spotlight party. Pinned, stumbled & sharing.